This Coconut Curry Lentil Bowl is a one-pot dinner that comes together in about 30 minutes. This vegan, gluten-free meal is full of flavor and is immensely satisfying. It pairs perfectly with warm naan bread. Do you want to know what’s an absolute tragedy? My kids don’t enjoy any meals where their food is mixed together or with any type of sauce. Yes, the one-pot meal, a busy mom’s dream dinner, is my kids’ worst nightmare. I’m a persistent gal, though, and one thing I’ve learned about feeding children is that their tastes and preferences do change, especially if you continue to serve them a variety of foods over time. I haven’t given up on the one-pot meal. I keep trying. I served this Coconut Curry Lentil Bowl to Meghan and Luke along with whole grain naan bread, raw vegetables, and applesauce. I added more to the meal (easy things I didn’t have to cook) because I knew they wouldn’t eat a lot, if any, of the one-pot meal I was serving as the main entree. I reminded Meghan that she loves chickpeas, and even though she was reluctant, she picked them out and ate them. Luke will do what Meghan does usually, so he followed his big sister and ate his chickpeas. They both were a n0-go to try the kale or saucy mix of lentils, and I didn’t push it. They devoured their naan (a favorite) and also ate all of their carrots, red peppers, and applesauce. This is a super quick and easy dinner. Quick, easy, AND healthy. Not an easy-to-come-by combination! Oh, and full of flavor. I just love coconut+curry together, and there’s also fresh ginger, lime, and cilantro that bring the whole thing together. I ate just this because of my anti-inflammation diet, but it’s perfect with warm naan bread. If you need a vegan, gluten-free, weeknight meal that is super satisfying, this Coconut Curry Lentil Bowl is exactly what you need. This is a one-pot dinner that comes together in about 30 minutes. This vegan, gluten-free meal is full of flavor and is immensely satisfying. It pairs perfectly with warm naan bread. In a Dutch oven or large high-sided skillet, combine the red lentils, tomatoes with their juices, coconut milk, water or broth, curry powder, ginger, turmeric, and salt. Bring the mixture to a boil, then reduce the heat, cover, and simmer for about 18 minutes. 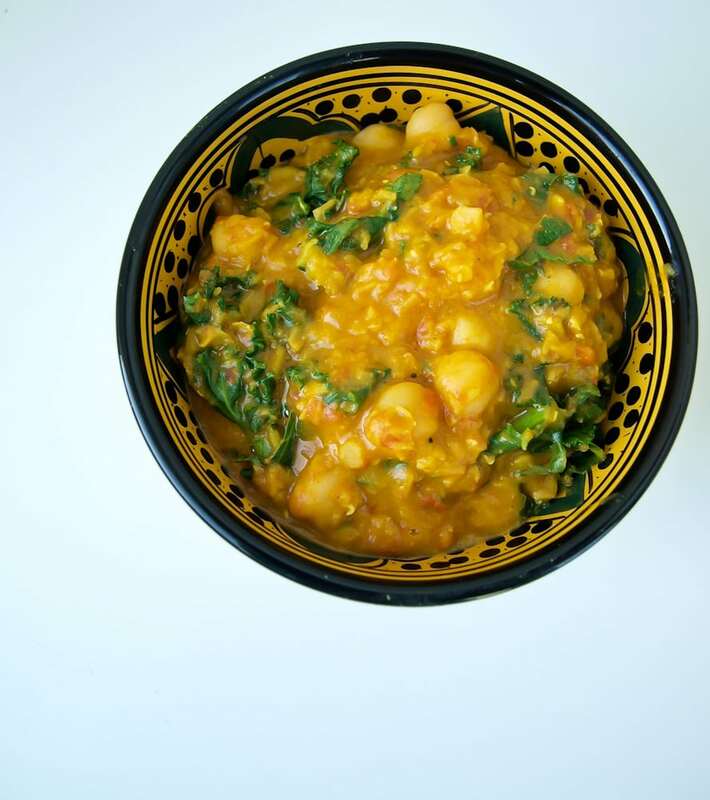 Stir in the chickpeas and kale and allow to cook another 3-5 minutes, until the kale is wilted and bright green. Stir in the lime and cilantro and serve. Enjoy! Even though I am going to wait a month to give you a detailed update of how things are going with my new diet and finger pain, I can’t wait to tell you how things are going. After one week on an anti-inflammation diet, I have seen a significant improvement in my finger pain! One week ago, I could not bend my finger in the morning and throughout the day making a fist was impossible. I can do both of those things now and the pain is much less. I did not expect to feel a difference so quickly, but I am more determined than ever to continue with the changes I’ve made. I’ll give you more details in time, but I just wanted to give you a quick update since I’m so excited about the results so far. Thanks again for all of your comments and support. I made a lentils, beans, kale stew and it is delicious (this is how dinner looks at our house). I am going to try your curry as we love curries at our house. We eat the stew with polenta as we can’t have gluten. But some naan bread would be delicious:). Ooooh polenta is a great idea! What a great dish, love this combination. So nice to here this meal worked with your children, sounds like persistence pays off. Seriously, what’s up w these goofy kids? Mine are the same way! I think it’s written somewhere that kids are ment to test your every attempt to make life easier/healthier/more organized. I made something similar w cauliflower and the darlings refused to eat it unless I seperated it on a plate. Hello, it’s a curry bowl? Yes! Everything must be deconstructed. So strange! Awesome job with the diet change- lowering animal product consumption is the best thing you can do for inflammation, and it decreases animal suffering and environmental destruction to boot. Very glad you are going to stick with it! So glad to hear that the anti-inflammation diet is working. Looking forward to receiving the one-month update. 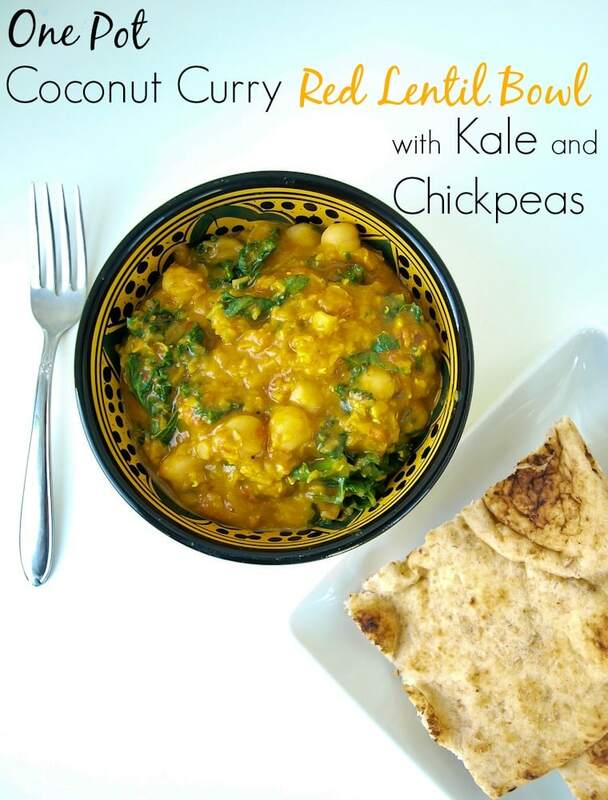 I just love a curry with lentils and chickpeas! This looks SO perfect! Love that it’s a meal in a bowl–my fave. So sad to hear that the kiddos don’t let things with sauces all mixed together…but I guess I could understand that. Pinning! how did you know i love one pot wonders and curry?! looks amazing and nourishing! Isn’t curry fabulous? One of my favorite flavors! Yum! This looks so good. Must make soon…for me, because I know my crazy kids will have no part in it. I can’t even get my 3 year old to eat a sandwich unless I separate each component. Luckily, I have older kids too, so I know that at some point the “pickiness” will go away. definitely pinning this to make this weekend for my meals next week. Love curry and love easy! This looked delicious! Made this recipe last night and LOVED it! We served over rice and it was a big hit. Thank you! We made this last night and LOVED it! We served it over rice and it was a big hit. Thank you!! Never mind I see now! Loved this! So easy and satisfying. I swapped the kale for spinach becasue that’s what I had. Thank you!